This homemade Christmas gift idea is fun, simple, and quick to create. Art magnets make a perfect handmade gift for family and friends. Each one contains a miniature art masterpiece making them a very personal gift. And the best part of all? They not only look beautiful, but they’re also functional. 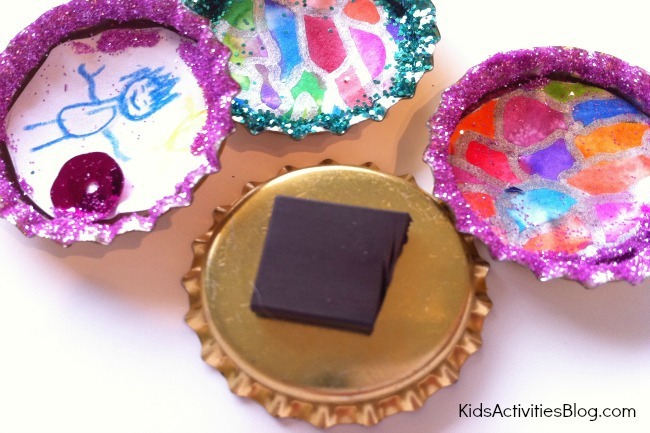 Kids Activities Blog loves multi-purpose gifts! Paper, pencils, permanent markers etc for kids to create some artwork. Alternatively you could recycle some of your children’s existing artwork. 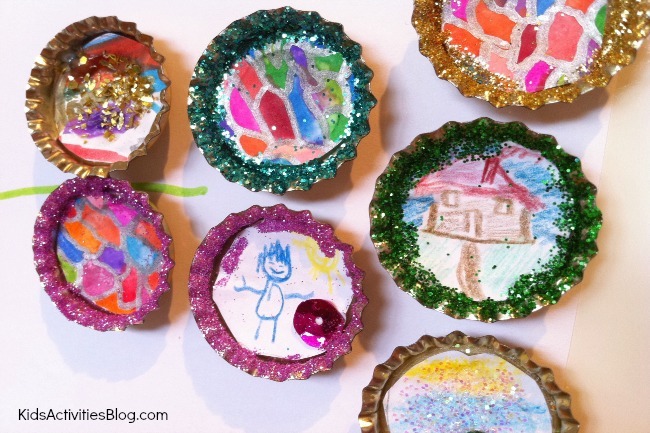 NOTE: If you don’t have any recycled bottle tops, they can be purchased from craft and hardware stores. Begin by making some colorful artwork. Eventually these drawings will be cut down to size to fit inside the bottle tops, so there are two ways to go about making the artwork. The kids can add patterns and color all over the page and then small sections can be cut down to size. 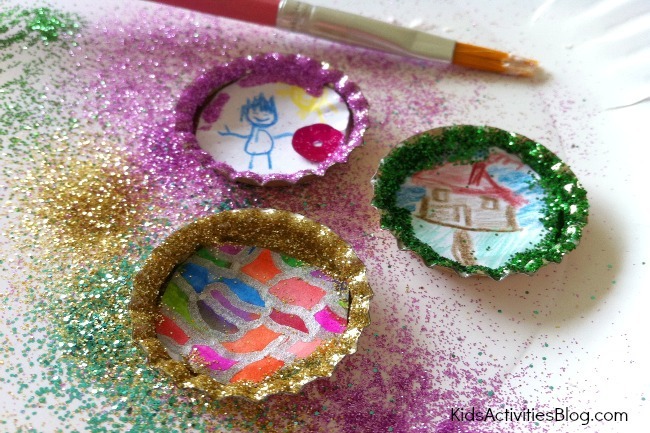 Alternatively you could draw circles on the page in a size to match the bottle tops, and then have the kids draw tiny pictures inside the circles. You could also recycle some of your children’s old drawings and paintings for this project. Next, cut the artwork down to size, to fit inside the bottle tops. To do this, I placed a bottle top onto the artwork, drew around the edge so that I had an outline to work with, and then cut a circle slightly smaller than the one I had drawn. There’s no need to be perfectly accurate with the cutting. Any gaps will be covered later on with glitter. 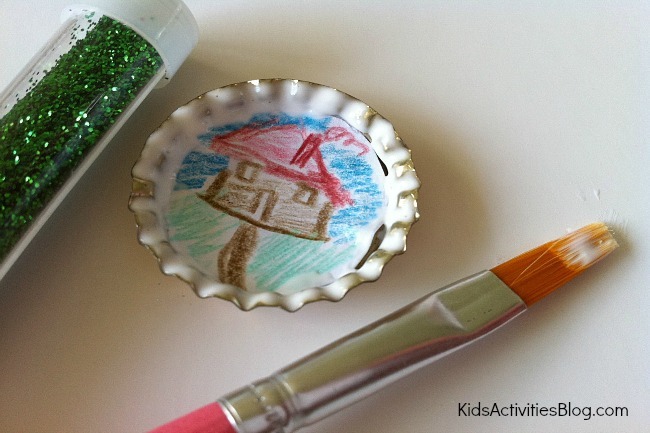 Use the glue to attach the circles of artwork to the inside of the bottle tops. At this point you can apply sequins or other decorative embellishments to the pictures. Next, apply glue to the outside edge of the bottle tops as shown in the picture above. It helps to use a small paintbrush to apply the glue. Now comes my favorite part. The glitter! I just love looking at the picture above with all of that sparkling color. Sprinkle glitter over the bottle tops, shake off the excess and admire how beautiful they look. We did this step over a paper plate which helped to contain the mess and clean up was a breeze because I just picked up the plate and tossed it away when we had finished. 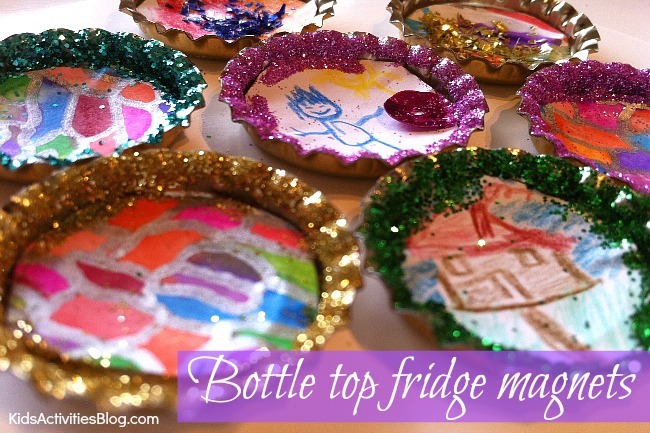 Once the glue and glitter are set, turn the bottle tops over and apply a magnet. We used a roll of adhesive magnetic strip which we cut down to size and then applied to each bottle top. You could also use a very small magnet, applied with glue. Small magnets for this type of project, as well as rolls of magnetic strip are available from craft stores. These look so beautiful on our fridge door. They make me happy every time I look at them. Each one has a little story attached to it as my four year old told me what he was creating with each picture. He told me that the magnet on the top left of this picture with the gold glitter is a picture of pirate’s treasure. The blue and yellow one that you can just see on the lower right corner of this picture is the ocean and the sun – and it’s snowing! I love these sparkly magnets and the miniature artworks they contain so much that I’m not sure I can give these away. We will have to make another batch to give as Christmas gifts for family and friends.